Previous Story Canon T6 Review: Can a modest upgrade sustain the popular entry-level Rebel through another generation? Good news, Fuji X-Pro2 shooters: Your camera just became a whole lot more capable. Or at least, it will do once you've installed a new firmware update released today by Fujifilm. 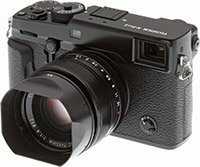 Fuji X-Pro2 firmware version 2.00 includes a lengthy laundry list of some 20 changes. Although there are a few smaller bug fixes and feature changes on the list, the majority of the changes can be found in a few key areas. Specifically, the new X-Pro2 update improves autofocus with an increase in the number of addressable AF points, more accurate AF algorithms inherited from the X-T2, more capable tracking, and a switch to focusing on the eye closer to the camera when using Eye Detection AF. With the new firmware update, the X-Pro2 now supports Fuji's recently-released EF-X500 flash. Additional functions like the multi-flash lighting, high-speed flash sync and so on can be used with the EF-X500. Accordingly, the FLASH SETTING and the Shooting Menu is dramatically changed. OFF:The frame moves according to parallax to show the focus point. ON:The CORRECTED AF FRAME in the OVF is fixed on the　recommended value described in the Owner's manual. If the minimum focus range of the attached lens is greater than the recommended value, the frame is displayed on the position of the minimum focus range. More details and the download itself can be found on Fujifilm's website.